In a recent active-shooter crisis at UCLA, many students found themselves in rooms without door locks. It's a grim and terrible situation, but one that can still benefit from quick design and engineering. 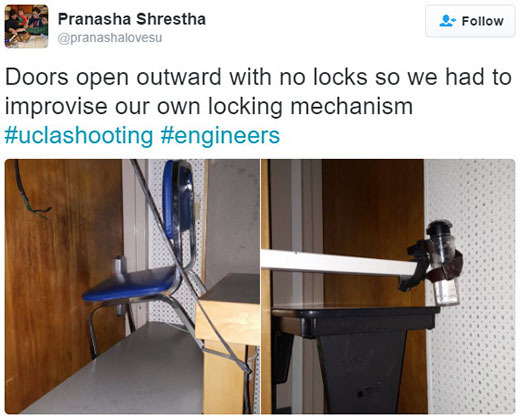 Pranasha Shrestha shows one example of the lengths some went to keep the doors closed - copied above, complete with hashtags - and Gizmodo cataloged many more. Locks are basic tools, whose presence or absence can be used for good or bad; the ability to improvise a change to the lock situation can be, literally, a lifesaver.